Following seven months of intense rehab and construction, Suntide Commercial Realty Inc.’s renovated Case Building – located in the heart of St. Paul’s Midway – is open and has already attracted major users. Kimley-Horn , a planning and design consulting firm with 80 offices around the country, is anchoring the 174,000-square-foot, warehouse-to-office conversion, which features creative tech and flex office space. The firm moved into 56,000 square feet of the building in September. Kimley-Horn outgrew its previous space at the Court International Building at 2550 University Ave. W in St. Paul. In addition, an unnamed tenant has signed a lease for 24,441 square feet and will take occupancy next February. “Our brokers, Kevin Peck and Jeff Hart of KW Commercial Midwest, have several prospects they are actively negotiating with” says Max Currie, a Suntide principal and Chief Engineer. The one-story, brick Case Building, which sits on more than 7 acres along Interstate 94 and Highway 280, is an old warehouse that was built in 1948 as a tractor parts distribution center by the Case Corp.
Suntide partnered with Eagan-based KW Commercial Midwest to lease the renovated building. They’re marketing it to companies that want to be near transit and that will appreciate the uniqueness and amenities the Case Building provides. The building features 15-foot-high ceilings, exposed ductwork, glass garage door fronts on several suites, and an expansive central corridor providing a “streetscape” that runs down the center of the building with large skylights and energy-efficient windows, relaxing seating areas, and open, collaborative spaces for group gatherings. Currie says “hands-down” the giant skylights are the feature that he would replicate in other rehab projects, because they bring significant natural light into the building. 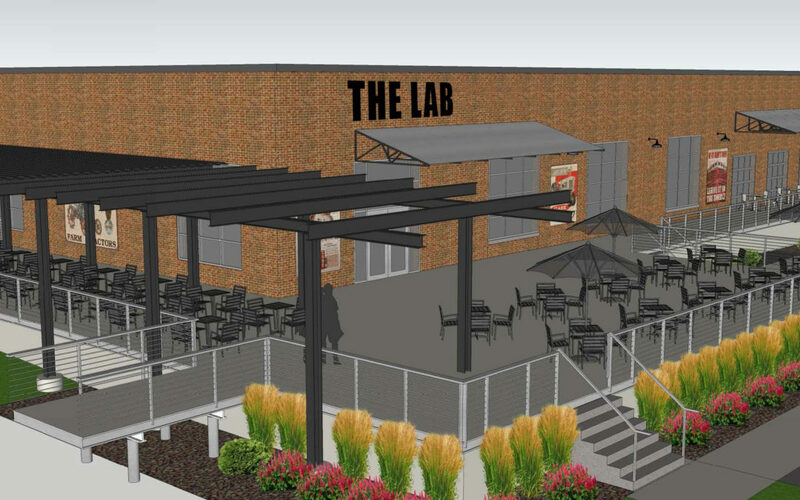 The Case Building has landed a 7,643-square foot lease with The Lab by BevSource for an on-site craft brewery and outdoor patio, with the first beer expected to be poured next February. Currie says it will not only serve as an amenity for the building but the entire community. Additional building amenities include bike storage, a bicycle repair station and private shower rooms. Area amenities include its location with the Green Line and several MTC bus routes steps away, and the new Saint Paul Grand Round bike path, which passes within a block and half of the building. The adaptive reuse of the Case Building is an integral part in the transformation of St. Paul’s up-and-coming Westgate industrial area, which encompasses about six blocks, into higher-use, mixed-use projects. In fact, the entire once-sleepy corner between Highway 280, I-94 and Minneapolis’ Prospect Park neighborhood is seeing new life. “This is that little pocket that was kind of forgotten and, all industrial and is now becoming office, residential and other uses,” Currie says. In addition to the Case Building conversion, apartment developer Dominium acquired the old Weyerhauser lumber site and is redeveloping it into residential. The developer also sold the city 3 acres of land for a park. Sunrise Banks acquired the old Radke Building and built a new headquarters, and Vertical Endeavors acquired an old warehouse along the frontage road facing I-94 for a new climbing wall location. “In the span of a little over a year, this entire area is going from industrial to all kinds of mixed-use, which is kind of amazing,” Currie says, adding that it’s also becoming a more walkable neighborhood. All of the building owners within the immediate area are working on creating a more pedestrian-friendly area. “As all of this is near completion, it will really start to tie together,” Currie says. Currie says Suntide is “actively looking” at a couple of other projects that would be similar in scope, if not size, to the Case Building. “They would also be ones where we would convert them from their current under-utilized status to nice, shiny new, yet rustic office or multi-use space. If a building can be saved and would serve a reasonably good function for the community, I would much rather save it than knock it down and start over,” he says. “It’s nice to take an older, neglected building that has a presence, fix it up and have the community be happy with what you did,” he adds.